Human Aortic Endothelial Cells (HAOEC) provide an excellent model system to study all aspects of cardiovascular function and disease, and they have been utilized in dozens of research publications to study diabetes-associated complications related to cardiovascular function, investigate mechanisms of immune response and graft rejection, study endothelial dysfunction caused by air pollution, oxidative stress and inflammation, and develop 3d endothelialized engineered tissues, as well as new technologies based on novel material surfaces and drugs in order to reduce risks associated with vascular implants. Select HAOEC lots have been additionally tested to demonstrate stimulation-dependent angiogenesis and key endothelial cell signaling pathways (phosphorylation of VEGFR, Akt, MAPK, and expression of Tie2, eNOS, Axl and Etk/Bmx). More information about pre-screened endothelial cells can be found on the Pre-Screened Endothelial Cell Product Page. 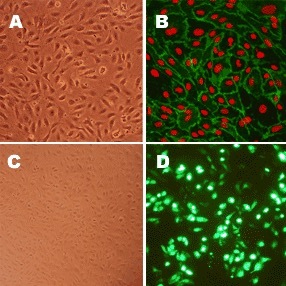 Additionally, HAOEC (along with human subclavian artery (HScAEC), carotid artery (HCtAEC), coronary artery (HCAEC) and brachiocephalic artery (HBcAEC), all provided by Cell Applications, Inc.) have been used to demonstrate that not only blood vessels from different tissues are highly heterogeneous, they also interact differently with leukocytes during the inflammation response. The authors further showed that differential N-glycosylation of commonly expressed vascular adhesion molecules may be responsible for this heterogeneity, as well as for modulation of signaling under resting and activated inflammatory conditions. This also explains why specific vascular beds may be more or less susceptible to particular diseases or stimuli. Importantly, if cells from different sources were used, these results could not be convincingly validated due to a number of uncontrolled variables, such as age, race, genetic variability or life style choices of the donors. To eliminate the donor-to-donor variability, the scientists took advantage of the great variety of primary cells offered by Cell Applications, including the option of ordering a panel of endothelial cells obtained from different vascular beds of the same donor! Human Aortic Endothelial Cells: HAOEC (A). HAOEC immunolabeled with Anti-CD31 antibodies (green); nuclei are counterstained with PI (red) (B). HAOEC (C) transfected with GFP plasmid DNA using the Cytofect™ Endothelial Cell Transfection Kit (D). Chiang, E. H. Ma, J. Wang, C. Liu, T. Chen andn S. Hung. 2016. Multi-lineage differentiation and angiogenesis potentials of pigmented villonodular synovitis derived mesenchymal stem cells - pathological implication. J Orth Res, 34:395-403. Hung, M., Y. Kao, C. Mao, T. Chen and W. Chen. 2016. Aliskiren attenuates the effects of interleukin-6 on endothelial nitric oxide synthase and caveolin-1 in human aortic endothelial cells. Nitric Oxide, 61:45-54. Wang, H., S. Chen and W. Lo. 2016. Identification of Cofilin-1 Induces G0/G1 Arrest and Autophagy in Angiotensin-(1-7)-treated Human Aortic Endothelial Cells from iTRAQ Quantitative Proteomics. Scientific Reports, 6, 35372. Wang, Y. W. Nie, K. Yao, Z. Wang andn H. He. 2016. Interleukin 6 induces expression of NADPH oxidase 2 in human aortic endothelial cells via long noncoding RNA MALAT1. Die Pharmazie, 71:592-597. Chang, E., H. Ma, J. Wang, C. Liu, T. Chen, and S Hung. 2015. Multi-lineage differentiation and angiogenesis potentials of pigmented villonodular synovitis derived mesenchymal stem cells - pathological implication. J Orthopaedic Res, DOI: 10.1002/jor.23031. Li, R., N. Jen, L. Wu, J. Lee, K. Fang, K. Quigley, K. Lee, S. Wang, B. Zhou, L. Vergnes, Y. Chen, Z. Li, K. Reue, D. Ann, and T. Hsiai. 2015. Disturbed Flow Induces Autophagy But Impairs Autophagic Flux to Perturb Mitochondrial Homeostasis. Antioxidants & Redox Signaling, doi:10.1089/ars.2014.5896. Nelson, J. 2015. Dynamic Blood Flow Modulates Endothelial Mitochondrial Redox States and Vascular Repair. PhD Dissertation, UCLA. Wang, H., S. Chen, and W. Lo. 2015. iTRAQ quantitative proteomics-based identification of cell adhesion as a dominant phenotypic modulation in thrombin-stimulated human aortic endothelial cells. Thrombosis Research, 135:944-950. Chang, M., C. Tsao, W. Huang, P. Chen, and S. Hung. 2014. Conditioned medium derived from mesenchymal stem cells overexpressing HPV16 E6E7 dramatically improves ischemic limb. Journal of Molecular and Cellular Cardiology, 72:339–349. Fu, X., X. Huang, P. Li, W. Chen, and M. Xia. 2014. 7-Ketocholesterol inhibits isocitrate dehydrogenase 2 expression and impairs endothelial function via microRNA-144. Free Radical Biology and Medicine, 71:1-15. Gardner, A., D. Parker, P. Montgomery, D. Sosnowska, A. Casanegra, Z. Ungvari, A. Csiszar, and W. Sonntag. 2014. Gender and racial differences in endothelial oxidative stress and inflammation in patients with symptomatic peripheral artery disease. Journal of Vascular Surgery, 3 April. Habib, A., V. Karmali, M. John, R. Polavarapu, G. Nakazawa, K. Pachura, T. Davis, F. Kolodgie, R. Virmani and A. Finn. 2014. Everolimus-Eluting Stents Improve Vascular Response in a Diabetic Animal Model. Circulation: Cardiovascular Interventions, 7:526-532. Liu, Y., D. Li, Y. Zhang, R. Sun and M. Xia. 2014. Anthocyanin increases adiponectin secretion and protects against diabetes-related endothelial dysfunction. Am J Physiol – Endocrinol & Metab, 306:E9. Tian, S., X. Ge, K. Wu, H. Yang and Y. Liu. 2014. Ramipril Protects the Endothelium from High Glucose–Induced Dysfunction through CaMKKβ/AMPK and Heme Oxygenase-1 Activation. J Pharmacol & Exp Ther, 350:5-13. Wang, H., Y. Huang, Y. Shih, H. W, C. Peng, and W. Lo. 2014. MicroRNA-146a decreases high glucose/thrombin-induced endothelial inflammation by inhibiting NAPDH oxidase 4 expression. Mediators of Inflammation, Volume 2014, Article ID 379537. Lee, C.-M., J.-A. Gu, T.-G. Rau, C.-H. Yang, W.-C. Yang, S.-H. Huang, F.-Y. Lin, C.-M. Lin, and S.-T. Huang. 2013. Low-Cytotoxic Synthetic Bromorutaecarpine Exhibits Anti-Inflammation and Activation of Transient Receptor Potential Vanilloid Type 1 Activities. BioMed Research International. 2013:Article ID 795095. Morita, M., S. Yano, T. Yamaguchi, and T. Sugimoto. 2013. Advanced glycation end products-induced reactive oxygen species generation is partly through NF-kappa B activation in human aortic endothelial cells. Journal of Diabetes and its Complications. 27:11-15. Saleh, S.M., R.S. Parhar, R.S. Al-Hejailan, R.H. Bakheet, H.S. Khaleel, H.G. Khalak, A.S. Halees, M.Z. Zaidi, B.F. Meyer, and G.P. Yung. 2013. Identification of the Tetraspanin CD82 as a New Barrier to Xenotransplantation. The Journal of Immunology. 191:2796-2805. Vedantham, S., D. Thiagarajan, R. Ananthakrishnan, L. Wang, R. Rosario, Y.S. Zou, I. Goldberg, S.F. Yan, A.M. Schmidt, and R. Ramasamy. 2013. Aldose Reductase drives hyperacetylation of Egr-1 in hyperglycemia and consequent upregulation of proinflammatory and prothrombotic signals. Diabetes:db13-0032. Wang, H.-J., W.-Y. Lo, and L.-J. Lin. 2013. Angiotensin-(1–7) decreases glycated albumin-induced endothelial interleukin-6 expression via modulation of miR-146a. Biochemical and biophysical research communications. 430:1157-1163. Wu, Z., G. Zhao, L. Peng, J. Du, S. Wang, Y. Huang, J. Ou, and Z. Jian. 2013. Protein Kinase C beta Mediates CD40 Ligand-Induced Adhesion of Monocytes to Endothelial Cells. PloS one. 8:e72593. Kanie, K., Y. Narita, F. Kuwabara, M. Satake, S. Honda, H. Kaneko, H. Honda, and R. Kato. 2012. Cell-Selective Peptide Distribution in Human Collagen Proteins. Kobunshi Ronbunshu, 69:129-134. Kanie, K., Y. Narita, Y. Zhao, F. Kuwabara, M. Satake, S. Honda, H. Kaneko, T. Yoshioka, M. Okochi, H. Honda, and R. Kato. 2012. Collagen type IV-specific tripeptides for selective adhesion of endothelial and smooth muscle cells. Biotechnology and Bioengineering. 109:1808-1816. Sakai, S., H. Inagaki, Y. Liu, T. Matsuyama, T. Kihara, J. Miyake, K. Kawakami, and M. Taya. 2012. Rapidly serum-degradable hydrogel templating fabrication of spherical tissues and curved tubular structures. Biotechnology and Bioengineering. 109:2911-2919. Wang, H.-J., H.-C. Huang, Y.-C. Chuang, P.-J. Liao, D.-M. Yang, W. Yang, and H. Huang. 2012. Modulation of tissue factor and thrombomodulin expression in human aortic endothelial cells incubated with high glucose. Acta Diabetol. 49:125-130. Wang, Y., Y. Zhang, X. Wang, Y. Liu, and M. Xia. 2012. Cyanidin-3-O-β-glucoside induces oxysterol efflux from endothelial cells: Role of liver X receptor alpha. Atherosclerosis. 223:299-305. Wang, H.-J., T.-L. Lu, H. Huang, and H.-C. Huang. 2011. Paclitaxel induces thrombomodulin downregulation in human aortic endothelial cells. Texas Heart Institute Journal. 38:20. Yew, T.-L., Y.-T. Hung, H.-Y. Li, H.-W. Chen, L.-L. Chen, K.-S. Tsai, S.-H. Chiou, K.-C. Chao, T.-F. Huang, H.-L. Chen, and S.-C. Hung. 2011. Enhancement of Wound Healing by Human Multipotent Stromal Cell Conditioned Medium: The Paracrine Factors and p38 MAPK Activation. Cell Transplantation. 20:693-706. Hou, X., J. Song, X.-N. Li, L. Zhang, X. Wang, L. Chen, and Y.H. Shen. 2010. Metformin reduces intracellular reactive oxygen species levels by upregulating expression of the antioxidant thioredoxin via the AMPK-FOXO3 pathway. Biochemical and biophysical research communications. 396:199-205. Li, R., Z. Ning, J. Cui, F. Yu, C. Sioutas, and T. Hsiai. 2010. Diesel exhaust particles modulate vascular endothelial cell permeability: Implication of ZO-1 expression. Toxicology letters. 197:163-168. Rong, Y., M. Zhang, L. Zhang, X.L. Wang, and Y.H. Shen. 2010. JNK-ATF-2 inhibits thrombomodulin (TM) expression by recruiting histone deacetylase4 (HDAC4) and forming a transcriptional repression complex in the TM promoter. FEBS letters. 584:852-858. Wang, H.-J., W.-Y. Lo, T.-L. Lu, and H. Huang. 2010. (−)-Epigallocatechin-3-gallate decreases thrombin/paclitaxel-induced endothelial tissue factor expression via the inhibition of c-Jun terminal NH2 kinase phosphorylation. Biochemical and biophysical research communications. 391:716-721. Wang, W. 2010. A Novel Role of HDAC5 in Flow-Induced Gene Expression. PhD Dissertation, U Rochester. Husband, A., M. James, and N. Kumar. 2009. 6-substituted isoflavonoid compounds and uses thereof. Patent Application US 20120003270 A1. Li, R., T. Beebe, J. Cui, M. Rouhanizadeh, L. Ai, P. Wang, M. Gundersen, W. Takabe, and T.K. Hsiai. 2009. Pulsatile shear stress increased mitochondrial membrane potential: Implication of Mn-SOD. Biochemical and biophysical research communications. 388:406-412. Li, X., Y. Rong, M. Zhang, X.L. Wang, S.A. LeMaire, J.S. Coselli, Y. Zhang, and Y.H. Shen. 2009. Up-regulation of thioredoxin interacting protein (Txnip) by p38 MAPK and FOXO1 contributes to the impaired thioredoxin activity and increased ROS in glucose-treated endothelial cells. Biochemical and biophysical research communications. 381:660-665. Li, X.-N., J. Song, L. Zhang, S.A. LeMaire, X. Hou, C. Zhang, J.S. Coselli, L. Chen, X.L. Wang, Y. Zhang, and Y.H. Shen. 2009. Activation of the AMPK-FOXO3 Pathway Reduces Fatty Acid–Induced Increase in Intracellular Reactive Oxygen Species by Upregulating Thioredoxin. Diabetes. 58:2246-2257. Wang, H.-J., H. Huang, Y.-C. Chuang, and H.-C. Huang. 2009. Paclitaxel induces up-regulation of tissue factor in human aortic endothelial cells. International Immunopharmacology. 9:144-147. Brito, L., S. Little, R. Langer, and M. Amiji. 2008. Poly(β-amino ester) and Cationic Phospholipid-Based Lipopolyplexes for Gene Delivery and Transfection in Human Aortic Endothelial and Smooth Muscle Cells. Biomacromolecules. 9:1179-1187. Heaton, A., N. Kumar, G. Kelly, and A. Husband. 2008. Compositions and therapeutic methods involving isoflavones and analogues thereof. Patent US 20090233999 A1. Maghzal, G.J., S.R. Thomas, N.H. Hunt, and R. Stocker. 2008. Cytochrome b5, Not Superoxide Anion Radical, Is a Major Reductant of Indoleamine 2,3-Dioxygenase in Human Cells. Journal of Biological Chemistry. 283:12014-12025. Wang, H.-J., H.-C. Huang, Y.-C. Chuang, and H. Huang. 2008. Thrombin induces the expression of tissue factor in human aortic endothelial cells. Acta Cardiologica Sinica. 24:151 - 156. Wang, X., Z. Liu, B. Zhu, P. Wang, C. Wu, and H. Xu. 2008. Molecular Characterization of Hypoxia-Hypothermia–Conditioned Human Endothelial Cells and Their Interaction With Human Monocytes. Transplantation Proceedings, 40:2127-2135. Zhang, L., Y. Wu, Z. Jia, Y. Zhang, H.Y. Shen, and X. Li Wang. 2008. Protective effects of a compound herbal extract (Tong Xin Luo) on free fatty acid induced endothelial injury: Implications of antioxidant system. BMC complementary and alternative medicine. 8:39. Zhu, B., Z. Liu, P. Wang, C. Wu, and H. Xu. 2008. A Nuclear Factor-κB Inhibitor BAY11-7082 Inhibits Interactions Between Human Endothelial Cells, T Cells, and Monocytes. Transplantation proceedings. 40:2724-2728. Hung, S.-C., R.R. Pochampally, S.-C. Chen, S.-C. Hsu, and D.J. Prockop. 2007. Angiogenic Effects of Human Multipotent Stromal Cell Conditioned Medium Activate the PI3K-Akt Pathway in Hypoxic Endothelial Cells to Inhibit Apoptosis, Increase Survival, and Stimulate Angiogenesis. Stem cells. 25:2363-2370. Oitate, M., T. Hirota, T. Murai, S.-i. Miura, and T. Ikeda. 2007. Covalent Binding of Rofecoxib, but Not Other Cyclooxygenase-2 Inhibitors, to Allysine Aldehyde in Elastin of Human Aorta. Drug Metabolism and Disposition. 35:1846-1852. Uchiyama, T., H. Atsuta, T. Utsugi, M. Oguri, A. Hasegawa, T. Nakamura, A. Nakai, M. Nakata, I. Maruyama, H. Tomura, F. Okajima, S. Tomono, S. Kawazu, R. Nagai, and M. Kurabayashi. 2007. HSF1 and constitutively active HSF1 improve vascular endothelial function (heat shock proteins improve vascular endothelial function). Atherosclerosis. 190:321-329. Yamatake, K., M. Maeda, T. Kadowaki, R. Takii, T. Tsukuba, T. Ueno, E. Kominami, S. Yokota, and K. Yamamoto. 2007. Role for Gingipains in Porphyromonas gingivalis Traffic to Phagolysosomes and Survival in Human Aortic Endothelial Cells. Infection and Immunity. 75:2090-2100. Shen, Y.H., L. Zhang, B. Utama, J. Wang, Y. Gan, X. Wang, J. Wang, L. Chen, G.M. Vercellotti, J.S. Coselli, J.L. Mehta, and X.L. Wang. 2006. Human cytomegalovirus inhibits Akt-mediated eNOS activation through upregulating PTEN (phosphatase and tensin homolog deleted on chromosome 10). Cardiovascular Research. 69:502-511. Shen, Y.H., L. Zhang, Y. Gan, X. Wang, J. Wang, S.A. LeMaire, J.S. Coselli, and X.L. Wang. 2006. Up-regulation of PTEN (Phosphatase and Tensin Homolog Deleted on Chromosome Ten) Mediates p38 MAPK Stress Signal-induced Inhibition of Insulin Signaling: A CROSS-TALK BETWEEN STRESS SIGNALING AND INSULIN SIGNALING IN RESISTIN-TREATED HUMAN ENDOTHELIAL CELLS. Journal of Biological Chemistry. 281:7727-7736. Uchiyama, T., H. Atsuta, T. Utsugi, Y. Ohyama, T. Nakamura, A. Nakai, M. Nakata, I. Maruyama, H. Tomura, F. Okajima, S. Tomono, S. Kawazu, R. Nagai, and M. Kurarbayashi. 2006. Simvastatin induces heat shock factor 1 in vascular endothelial cells. Atherosclerosis. 188:265-273. Wang, J., Y.H. Shen, B. Utama, J. Wang, S.A. LeMaire, J.S. Coselli, G.M. Vercellotti, and X.L. Wang. 2006. HCMV infection attenuates hydrogen peroxide induced endothelial apoptosis – involvement of ERK pathway. FEBS Letters, 580:2779-2787. Wang, X.L., L. Zhang, K. Youker, M.-X. Zhang, J. Wang, S.A. LeMaire, J.S. Coselli, and Y.H. Shen. 2006. Free Fatty Acids Inhibit Insulin Signaling–Stimulated Endothelial Nitric Oxide Synthase Activation Through Upregulating PTEN or Inhibiting Akt Kinase. Diabetes. 55:2301-2310. Zhang, W.-Y., E. Schwartz, Y. Wang, J. Attrep, Z. Li, and P. Reaven. 2006. Elevated Concentrations of Nonesterified Fatty Acids Increase Monocyte Expression of CD11b and Adhesion to Endothelial Cells. Arteriosclerosis, Thrombosis, and Vascular Biology. 26:514-519. Nordskog, B.K., W.R. Fields, and G.M. Hellmann. 2005. Kinetic analysis of cytokine response to cigarette smoke condensate by human endothelial and monocytic cells. Toxicology. 212:87-97. Owing, J. 2005. Smoking and health: new research. Nova Publishers. Raveendran, M., J. Wang, D. Senthil, J. Wang, B. Utama, Y. Shen, D. Dudley, Y. Zhang, and X.L. Wang. 2005. Endogenous nitric oxide activation protects against cigarette smoking induced apoptosis in endothelial cells. FEBS letters. 579:733-740. Xu, J., J. Zhou, N. Wang, and H. Xu. 2005. Effects of 4-hydroxy-2-nonenal on cultured human aortic endothelial cells and myocardial cell. Engineering in Medicine and Biology Society, IEEE-EMBS, 27th Intl Conf. 5598-5602, DOI: 10.1109/IEMBS.2005.1615755. Nordskog, B., A. Blixt, A. Zieske, and G. Hellmann. 2004. MMP-1 polymorphic expression in aortic endothelial cells. Cardiovasc Toxicol. 4:75-83. Raveendran, M., D. Senthil, B. Utama, Y. Shen, D. Dudley, J. Wang, Y. Zhang, and X.L. Wang. 2004. Cigarette suppresses the expression of P4Hα and vascular collagen production. Biochemical and biophysical research communications. 323:592-598. Ryu, J.-W., K.H. Hong, J.H. Maeng, J.-B. Kim, J. Ko, J.Y. Park, K.-U. Lee, M.K. Hong, S.W. Park, Y.H. Kim, and K.H. Han. 2004. Overexpression of Uncoupling Protein 2 in THP1 Monocytes Inhibits β2 Integrin-Mediated Firm Adhesion and Transendothelial Migration. Arteriosclerosis, Thrombosis, and Vascular Biology. 24:864-870. Shen, Y.H., B. Utama, J. Wang, M. Raveendran, D. Senthil, W.J. Waldman, J.D. Belcher, G. Vercellotti, D. Martin, B.M. Mitchelle, and X.L. Wang. 2004. Human Cytomegalovirus Causes Endothelial Injury Through the Ataxia Telangiectasia Mutant and p53 DNA Damage Signaling Pathways. Circulation research. 94:1310-1317. Barbosa, M., H. Brady, K. Chan, and J. Pardinas. 2001. Monitor therapeutic activity of estrogen modulator; obtain vascular endothelial cell, incubate with modulator, monitor expression of estrogen marker, presence of estrogen marker indicates modulator of cardiovascular activity. Patent Application US 20030054332 A1.